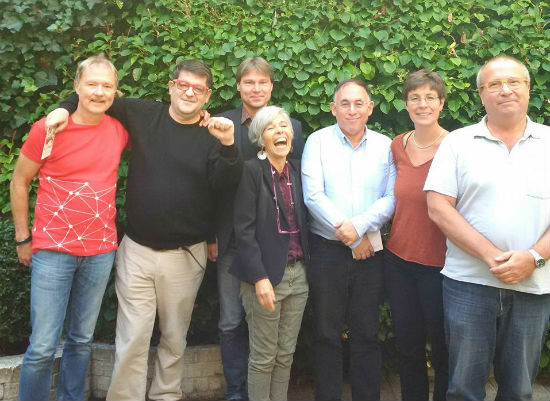 On 18-20 September, about 25 LabourStart senior correspondents and translators, together with partners from the global union federations, met at the offices of the German national trade union centre in Brussels for our first-ever strategic retreat. It was a meeting with few speeches and lots of discussion and resulted in a long action plan, including the creation of a very small Executive and a number of working groups. The Executive members (pictured below) are Espen Løken, Andrew Casey, Kirill Buketov, Silvana Pennella, Eric Lee (editor), Gisela Neunhöffer, and Derek Blackadder. Bank: Our bank, the trade-union-owned Unity Trust, has changed its sort code. If you need to make transfers to our account, write to ericlee@labourstart.org and I’ll send you the new details. Books: I have ordered, and will be distributing, 60 copies of our red book on online campaigning at the upcoming FES event on online campaigning in Berlin, early next month. We launched a new campaign in support of workers in Kyrgyzstan, working together with IndustriAll. Mulberry, the target of our current Turkey campaign, has written to everyone who sent a message laying out their side of the story. IndustriALL will be giving us a response. We are in discussions with FIM, the musicians’ GUF, about a possible campaign in support of their affiliate in Cameroon. We sent out a mass mailing in English to promote our victory in Aeroflot — and to encourage people to sign up to all our current campaigns. Though not a formal campaign, we gave extensive publicity on the site and on social media to the death in custody of an Iranian trade union activist, Shahrokh Zamani. Conference: Our Global Solidarity Conference will be held in Toronto in May 2016. More details coming soon. Inside LS (this blog): I’ve tried to fix the automated mailings of new posts from here so that the subject line isn’t always “Breaking News” — we’ll know in a moment if that worked. Mailing lists: We added 193 new subscribers this week, 245 last week, and 580 the week before that, for total of 1,018 — mostly to the English list. Portuguese/Brazilian LS: We’ve gotten our Facebook and Twitter feeds going now. We also now have a ‘What is LS?’ page there in Portuguese. The German national trade union centre DGB has a major article on LabourStart in their magazine, both the print and online versions. I completed the text of an interview about LS for an Italian language magazine published in Luxemburg. I was invited to speak at two meetings of Waltham Forest UNISON in North London, and publicized our campaigns, giving out our flyers to a few dozen members. Several of us met in Brussels with the head of communications of the European Trade Union Confederation and discussed cooperation. UnionBook: We’ve had to migrate control of the domain name (unionbook.org) from our previous provider, and managed to get this to work, though the site was offline for several hours. We’ve removed all references to LabourStart from its front page as we consider next steps for this social network.